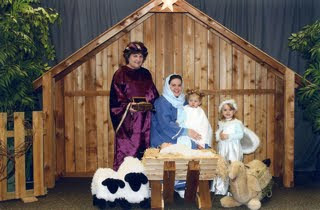 This afternoon my mom and I took the girls to see a nativity exhibit at a church in Colleyville. Jay: You are going to see what? Jay: What do they have there? Me: Nativities, like over 1,000 of them! Jay: You are going to see over 1,000 models of the same thing? And we did! 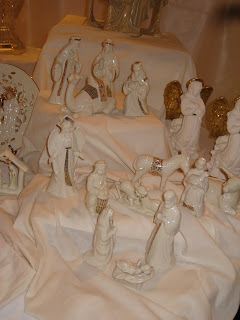 My mother actually collects nativities so I think she really enjoyed seeing them. She said she wants to go back next year alone so she can really spend some time inspecting them. Jane was really excited to go because she thought she was going to get to "meet Jesus" and poor thing she was HIGHLY disappointed when she realized baby Jesus wasn't actually there. My favorite part of the exhibit was dressing up for a picture of us in a live nativity. Here are some shots we got of some of the nativities, not even close to all of them because like I said there were over 1,000. They had one room that was all children nativities. So cute! Jane was especially excited to see one of the Little People nativities like we have at home. It is a BIG hit with both Jane and Jill at our house (actually Jill is playing with it right now as I type!) Here are some pics from the kids room. Like I said though, my favorite part of the exhibit was dressing up for the live nativity. 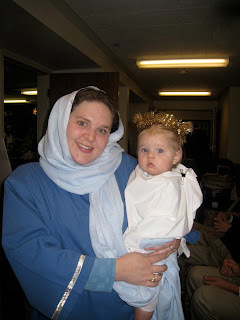 As you can see I dressed as Mary and mom is one of the wise men and the girls are both angels. I think Joseph must be around back tending to some sheep or perhaps swapping traveling stories with the other two wise men? I still love the picture! Jill looks totally precious in that last pic. I collect nativities too and I would really love to see all of those. I bet there were some amazing ones! I love how they let you dress up and take a photo in a live nativity. How cool! Some of those you pictured were beautiful!! I'm sorry Jane felt shorted! Darling angels! How adorable is it that Jane thought she was going to meet Jesus?! From the mouths of babes....I remember when I was little, we were flying somewhere and as soon as we got above the clouds, I thought we were in heaven and I asked my mom where Jesus was. I know! I explained to her many times that Jesus grew up and now he lives in Heaven but she just can't get past the Christmas story and thinks baby Jesus is someone completely different than the other Jesus she's heard of. I told mom from now on I think I will just take her to places without really telling her where we are going first so as not to disappoint her when it doesn't fulfill whatever expectations she sets for it.